Somehow it feels like I've been away from my blog for weeks! Life has gotten busy lately and I've missed being here. Today was fantastic. Addison and I spent the sunny afternoon perusing shops I've been wanting to peek into, eating ice cream, and running races on the sidewalk, and racing matchbox cars at home. My camera is becoming more and more a part of me, and I sometimes feel insatiable in my desire to explore the city and take photos. I am certainly disappointed each time we head out somewhere, whether to a friends house for bagels or downtown to window shop, and I arrive only to discover I've left my camera at home. It can really sort of ruin my trip. But today I remembered, and it was so satisfying to come home with a camera full of images. I'll post a few more tomorrow. My husband, Ben is out of town today and tomorrow, and after a difficult "no-nap" day with Addison yesterday, an entire weekend of single parenting sounded like too much to handle. I sort of had a tantrum about it when I woke up this morning, apparently completely emotionally unprepared for the day ahead. So, what to do when you start the day off on the wrong foot? Number one, apologize for being such a ridiculously moody and difficult pregnant wife. Number two? Bake something delicious. I give you: Blueberry Peach Tartlets. This was hands-down, one of the best breakfasts I've ever had at home. Flaky, fruity, not to sweet, and so very, very delicious! I have never used puff pastry before, but after today it will immediately become a staple in this household! I used one sheet of puff pastry dough (I used Pepperidge Farm) and cut into 4 squares. Fold the edges of each one over to make a little crust, or a ridge to keep the filling from going all over the place. Next I used about 1 cup of frozen blueberries and about 1/2 a cup of frozen peaches, put them in the microwave on defrost with few teaspoons of sugar and a squirt of lemon juice, and arranged them in the little tartlets. Since even the folded over puff pastry didn't create much of a ridge, I reinforced it with the peach slices around the edges to keep the blueberries from rolling out. Sprinkle a little more sugar on top, and put them in the oven at 375 degrees for 30 minutes. These tartlets must have really worked some magic, because after breakfast, everything was coming up roses (well, Mr. Addison tried the no-nap thing again today, but finally settled in after a while, thank goodness!). My mom and sister came by to keep us company for a bit, and then Addison and I went on a special dinner date--just the two of us. He sure knows how to treat a lady...He told me he thought I was pretty, said he loved me, and I even got a kiss goodnight! I'm a lucky girl. Results of the fun weekend? I left the party mid way since I was so nauseous I could no longer have a normal conversation. Its really bad when you have to interrupt someone you are just getting to know to tell them, "I'm sorry, but I just have to sit down".. and mosey on over to the corner of the room and sit by yourself. And to make matters worse, it was my husband's office party, and I felt like I was giving off the impression to his coworkers that I was either too bored or too insecure or too lame to be having fun. In reality I was just too sick, and I went home at 9:30. Le sigh. I also missed the concert. No good story there, except I was just sad to be at home watching old SNL clips instead. Le double sigh. Luckily, after we'd all had our turns being sick, we managed to get out of the house all together on Monday for some frozen yogurt at Skinnidip. Wow, I had heard about this place, and it even made my to-do list, but the experience far surpassed my expectations! It was creamy, delicious, tart and not too sweet, and the topping choices were great. I enjoyed the plain yogurt with fresh raspberries best. Addison ended up liking mine better because I'd gotten brownie pieces in it. And, when every last bite had been devoured, he nearly cried because he wanted some more. Oh the joy of toddlers! Here's to a fine new week, with better health, a fine new President and hope on the horizon! Friday: Red.....I mean, wait a minute - stripes or plaid! Ok what the heck universe am I living in? All week I've had this rooster shot all ready to go for "Friday's RED day" and then I went on my merry way posting this this morning, and then headed over to Curious Bird and was like oh, uhhhhh....ummm, plaid? stripes? How did I miss that? So now I feel like a doof. But, here's what I could conjure up as "stripes" from my photos this week. Chickens are harder to photograph than they seem! Happy color week to all the fantastic bloggers who participated and a huge thank you to Leya for organizing it! These are my son's shoes... and I adore them! See more color week participants here. I've been uber-domestic all weekend, and really loving it. I put up new curtains, switched up the throw pillows and put in a new lamp in the living room, rotated all Addison's toys to spark new interest in playing with them (always works like a charm), did waaaay too much housework, and cooked, cooked, cooked. The cooking was especially rewarding because I made a couple of really delicious meals from scratch, and without so much as glancing at a recipe. Last night I made up some mushroom-rice soup with vegetables on the spot, which was a surprisingly flavorful and satisfying dinner. If only I'd had a loaf of crusty bread to go with it... But I'm trying really hard not to go grocery shopping unless we absolutely need to. We had grilled cheese sandwiches with tomato instead, and they were rich, crispy and golden brown. Today, I was feeling particularly inspired, and sauteed a few strips of bacon, caramelized a whole onion in the drippings, added some mixed mushrooms and fresh sage, and served it on top of polenta with sharp cheddar. I made a side salad with arugula, chopped apples, pecans, golden raisins, and blue cheese dressing. It was so very, very yummy and I ate up every bite. I started reading In Defense of Food: An Eater's Manifesto yesterday, and its really interesting. The overall concept of eating natural, minimally packaged and altered foods is not new to me. I generally eat that way anyway, but it helps bring it to my consciousness again, and its eye-opening to read the social, political and legal history of how we as a society came to eat the way we do. Other highlights from my weekend included a very small birthday party for a girlfriend, complete with tea and cheesecake, lovely, decadent naps (oh I could have used about 3 more, but they were nice), and a spontaneous trip to the library where our timing was rewarded with free apples and a very charming singer/storyteller. I even managed to take a photography walk this morning, all by myself. It was so fun to window shop, watch all the people lining up outside their favorite breakfast spots and take my sweet time. I'm lookign forward to sharing some of my snapshots with you throughout the week, since I'm participating in Leya's Color Week. My son Addison is exceptionally gifted. Though I never talk about Addison with the intention of bragging about him or comparing what he can do with what other children his age can do, sometimes its hard to hide my own excitement and amazement at his abilities. And why should I hide it? I am a proud mother, and I want to be able to openly share stories about who my child is with people around me. Unfortunately, it is a subject that has proved to be a difficult topic to discuss openly, particularly with other parents who have children who are of a similar age. I tread carefully when people begin to inquire. "Is he a little bit advanced for his age?" they ask after observing him telling time on an analog clock, for example. I nod, and casually say, "Yeah, he's a pretty bright kid," or "he really, really loves numbers." At this point, I do my best to read the person I'm speaking with to see if they have already become threatened or not. I may get a choked, "Wow, that's great." as I watch their face change to a somber expression and they shuffle and look away... I immediately drop the subject. An exchange like this can make me feel uncomfortable for the next hour or so. Did I say too much? Did I come across like I was bragging? No! I didn't!!! Then why do I feel so weird? I don't like it, and I don't want to feel this way anymore. I have the right to take joy in talking factually about my child's abilities and strengths just as anyone else does. I've been afraid to write about it here, fearing the silent discomfort that might be present out there. But I can't afford to be afraid of that anymore, not only for my own good, but for Addison! Our family is different, and blessed in our own unique ways, and I'm so proud of who we are! We did have a lovely afternoon together yesterday, Addison and I. As a mother who works part-time, the afternoons I spend with my son are sometimes a battle between spending quality time with him and getting the house things done that I want/need to be done. Like most things, its a delicate balancing act, and I often wonder if I'm getting it right. The best afternoons together strike that perfect balance when he either finds a few happy minutes of playing alone while I unload the dishwasher, or even better, if he can be involved in what I'm doing somehow. Today, you all are inspiring me, and I am so thankful to have some ideas up my sleeve! First, I visited Curious Bird this morning, and was completely smitten by the article she posted from the New York Times. I want to study and study this article until I am an expert on using the ingredients in my pantry to their fullest potential. Its got me drooling and thinking up a million ideas for dinners! Maybe if I can cook like that I can even pretend I am the woman in this delicious book I read this summer. Anyway, between that article and the post over at poppytalk today with those lovely labels, I got to thinking about the messy state my spice rack is in, and the little jars of spices in the back that haven't been used in a good.long.while. Plus, all the labels I made about 4 years ago are starting to peel off, so I think we'll get out my antique typewriter and make some new ones together. Addison should get a kick out of spelling his name on it. Maybe we can make some stickers for learning spanish words for things around the house too.... oooh. good one. Then, I popped on over to maya*made, where she always has some fantastic project for kids going on, and saw her lovely seashells and beachcombings. I have a nice collection of things from the Oregon Coast and elsewhere, and they haven't been taken out of their jar and handled and examined in far too long. It will be a great chance for Addison and I to explore nature inside. I say it all too often, but you all inspire me daily and I'm so happy to be a part of your blogging world! Ahhhh. Now that my pregnancy is all out in the open, I can tell you about all the cravings I've been having. The drama of it all has subsided a bit, but a few weeks ago, it was like "I MUST EAT PEACH PIE! I MUST HAVE IT NOW! "......2 hours later.... "I NEED PROTEIN! LET'S GO OUT FOR CHEESESTEAK SANDWICHES!" It's been a little nuts, but at least its been fun to follow my stomach into culinary heaven. Technically, this is a "Faux Pho" recipe. I guess there was a limit to what I would do, since I wasn't about to roast a whole chicken for this, as is traditionally done. But, the results of this modified "faux" recipe were surprisingly comparable to the restaurant varieties I've tried, and it was even better for lunch the next day! Cook noodles according to the directions on the package, then drain and set aside in a large serving bowl. 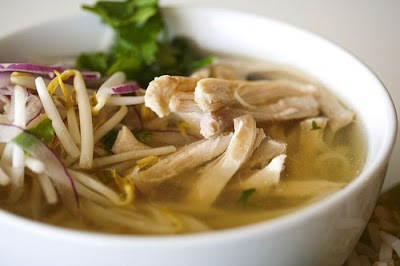 Combine chicken broth, onion slices, fish sauce, sliced baby carrots and chicken in a soup pot; bring to a simmer. In a tea infuser, add the whole cloves, sliced ginger, garlic, star anise and place in the soup pot with the chicken. Simmer the chicken, vegetables and spice mixture for about 30 minutes, until chicken is tender and cooked through. Remove chicken and cool it until you can cut into small pieces, then place back into the simmering soup pot. Remove the tea infuser, discard ingredients inside. Ladle the soup into the large serving bowl with the noodles. Add the bean sprouts, green onions, cilantro and basil leaves to the serving bowl. Enjoy this on any cold day, or a hot one for that matter... I think its better for a common cold than traditional Chicken Noodle Soup! Me neither!!! That's the un-smelly, un-smokey flavor of ALL of Oregons restaurants and bars as of January 1st. As someone who cannot stand coming home after an otherwise lovely night out, smelling like an ashtray, I couldn't be happier about this NO SMOKING law taking effect. And, in other good news, laws will also take effect that put a 5 cent bottle deposit on all plastic water and flavored water bottles, and you can now recycle all TVs and computers at Oregon recycling stations for free! Oregon, I love you and all your forward-thinking citizens! I feel strangely at peace on this new morning. I can feel the year ahead of me...open and fresh with new paths and opportunities, and challenges too. I'm eager to embrace it all and enjoy the ride.